Trying something new with the aim of semi-regular updates regarding what I’m reading, working on, and thinking about. 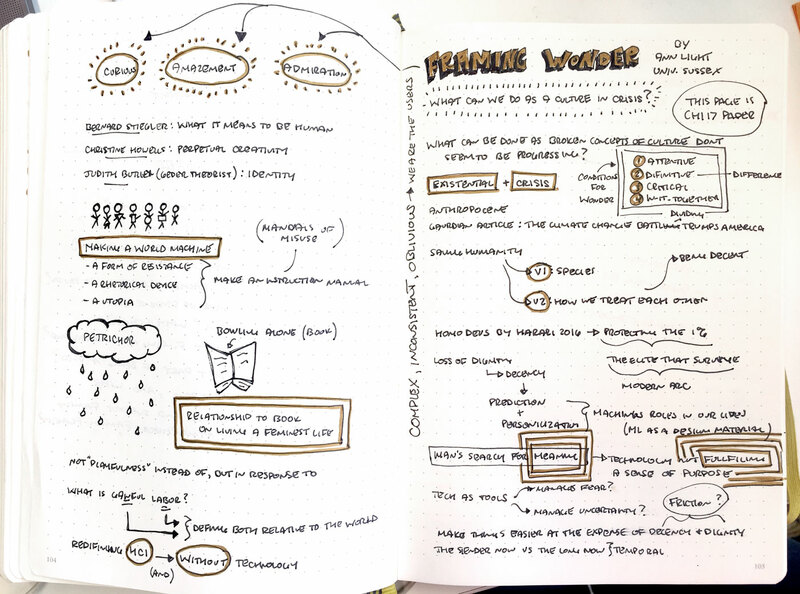 Last week had a short chat with Ann Light from the University of Sussex regarding my work and attended her guest lecture Framing Wonder: Beyond Design for Existential Crisis (sketch notes above). Dark yet very inspiring talk and highly recommend her related paper Design for Existential Crisis from CHI17. Both the talk and her paper inspired me to look into care ethics and feminist theory regarding my work. For a recent paper and my ongoing multi-disciplinary project work, have been thinking a lot about Terry Winograd’s Shifting viewpoints: Artificial intelligence and human–computer interaction, in particular how to work across philosophical and methodological differences. Based on a colleague recommendation, recently listened to Our Robots, Ourselves: Robotics and the Myths of Autonomy by David Mindell, a very accessible contribution to discourse on the meaning of autonomy. Throughout the book, within each of many case studies, he repeatedly challenges listeners (readers) to ask, ‘Where are the people, which people are they, what are they doing, and when are they doing it?” as he proposes an emphasis on human-computer relationships rather than the idea or potential of replacement. My favorite of his examples regards remote control of Mars rovers from Earth bound operators and the coinciding debate if presence can be felt at such a distance and with significant time delays – is remote presence real presence? Last week discussed Things That Keep Us Busy: The Elements of Interaction by Lars-Erik Janlert and Erik Stolterman in a research book club with a focus on Implicit Interaction. I found the book an easy read as it was very much like a collection of papers (which most of it draws from). While I appreciated the provision of definitions, frameworks and objective perspective – as in taking the object’s instead of the user’s perspective – overall there was much I disagreed with, in particular the notion that implicit interaction decreases interactivity, and found it difficult to maintain a narrow perspective that doesn’t regard the social or systemic implications. Perhaps also, it seemed to contrast philosophically with Dewey’s Art of Experience which I am reading for a PhD course on the theoretical foundations of UX, and as a design researcher situated in a technical university am over-resisting the application of frameworks upon a field dependent on embracing the subject, chaotic, and messy nature of the world. Attended a great talk by my friend Lorenzo at IxDA Stockholm’s event Questions and answers in the design process with Nordic Morning. Great nuggets regarding the materialization of cultures to engage people in discourse and materialization of infrastructures to enable designers to transform them. Definitely calls for a revisit of his paper Materializing infrastructures for participatory hacking. Lastly, in addition to a bunch of course grading, this week I’ll be continuing concepts derived from a recent project workshop on designing with data and starting a new project with three KTH master’s student on prototypes to probe the notion of training when approaching Machine Learning as a design material. A related paper includes UX Design Innovation: Challenges for Working with Machine Learning as a Design Material. This entry was posted in Implicit Interaction, Interaction Design, KTH Royal Institute of Technology, PhD'ing, Stockholm on November 6, 2017 by admin.